Almost a year after notifying rules for allocation of coal blocks following the coal scam, the Central government has put the first set of blocks on the market. 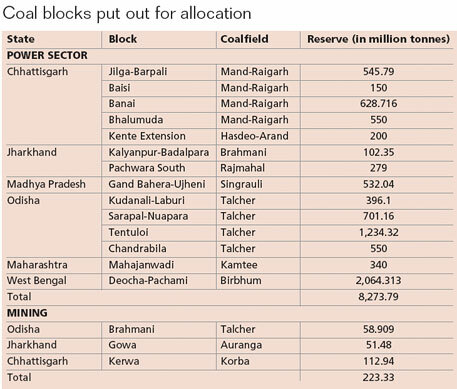 Of the 17 blocks being offered, 14 have been earmarked for the power sector and three for commercial mining (see ‘Who’s afraid of auctioning coal?’, Down To Earth, April 16-30, 2012). While many of the coal blocks, like Brahmani in Jharkhand, Banai and Kente in Chhattisgarh, include forests, some fall in the critically polluted area (CPA) category as recognised by the Union Ministry of Environment and Forests (MoEF). For example, Talcher in Odisha and Korba in Chhattisgarh. Applications seeking allotment of coal blocks will be accepted only from state-run firms by January 30, the Union Ministry of Coal (MoC) announced on December 31. The Central government-owned Coal India Limited, which mines 80 per cent of the country’s coal, is not eligible to apply for these blocks. 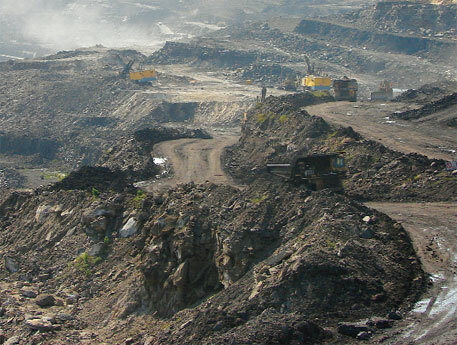 The allocation will be based on the Auction by Competitive Bidding of Coal Mines Rules of 2012, notified in February. Firms that get the blocks will have to pay a reserve price fixed by MoC. The government, however, has not provided any details on what is the reserve price and how it has been fixed. Two weeks before the MoC’s announcement, an inter-ministerial committee was constituted to look after the process of allocation. Despite some of the blocks falling in CPA and including forests, the committee does not have any representative from MoEF. As part of the eligibility criteria, the committee presented some parameters, including applicants’ business and financial details and mining experience. The committee said interested firms with experience in coal mining will be rated on a scale of 30 points, while novices will be judged on a 27-point scale. Three points have been assigned for the firm’s past record on development of blocks. Rest of the break-up is same for both the cases: distance of plant from the mine has been assigned three points; closer the plant, more points the applicant gets. Nine points have been kept aside for the preparedness of the firm like in the terms of land acquisition and in-principle water allocation approval. The next evaluation criterion is the demand and supply gap of the state during the 12th and the 13th Five Year Plans, implying that firms setting up projects in states with higher coal shortage are more likely to be allocated reserves. Nine points have been assigned for this criterion. Further, six points have been assigned for the firm’s financial positions. Firms scoring the maximum points will be eligible for the next round. Hemant Jain, director of coal block allocation, MoC, explains: “This is the first step which involves only the technical aspects of mining. The next step will be inviting a competitive tariff-based bid from the shortlisted players.” The cut-off for selecting firms for the second round will be decided by the inter-ministerial committee. Similar criteria have been laid down for government firms that apply for blocks only for mining. These will be judged on a 20-point scale if they have previous mining experience, otherwise 15. Capability to mine has been assigned three points, a firm’s financials five and demand-supply gap seven points. our principals N.R.I s a small group, presently interested in imported coal,trading and in the process of establishing a coal trading house to cater small industries. how best you would advice us in the above imported coal trading house.